It is so reassuring to know that, after that cross appears on the pregnancy test all I have to worry about is looking after my little bubba growing in my tummy and think about how I would like to welcome him into the world. When I found out I was pregnant, after the initial shock and first trimester I started joining a few Facebook groups. One of the groups I joined was for mums that are planning a natural or homebirth. After a few weeks, it became clear that most of the members were from the USA and the comments they were posting really started to intrigue me. They fascinated me because, as many of you might know, I LOVE America! I visit as often as our bank balance will allow and even got married there back in 2008. One of the things that draws me to the USA are the people and its modern, western culture. My brother lived in America for nearly ten years so I am vaguely aware of how their health insurance works and I always thought it was quite a good idea, especially given that our NHS hospitals sometimes leave a bit to be desired and in general American hospital are more like hotels. During every pregnancy, including my first with twins, the routine is fairly simple. I book an appointment with GP (free) who then asks me which hospital I would like to have the baby in – that’s right, I am given the choice. Then I meet with a midwife who ‘books’ my pregnancy in. My scans are arranged and follow up appointments booked. At some point during these appointments I will be asked about my birth plan. Apart from the twins I have always opted for a homebirth. When I asked my GP about my first homebirth with Charlie she was so pleased for me and even encouraged me. She explained that given the straightforward birth I had with the twins, the fact that I was well and lived fairly close to my nearest hospital she thought it was a great idea! Even though she had given me such reassurance I still asked my midwife at my next appointment what her opinion was. That was it, my mind was made up, what she had said made perfect sense to me. My pregnancy continued to be monitored and thankfully I stayed a low-risk until delivery. I was appointed a wonderful homebirth team who came to my home for all my appointments, met my family and talked me through everything, working side by side with the hospital. With the help of my fantastic midwives, Charlie was born calmly and safely at home. Straight after the birth Mikey and Harri were cuddling their newborn brother, ticked up on bed with mummy and daddy. 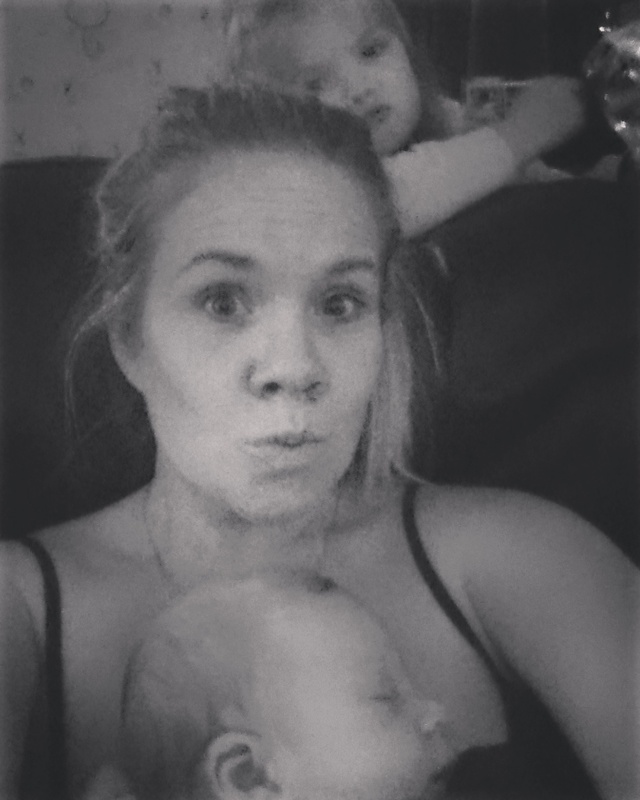 My experience was so perfect I opted for another homebirth with Libby. Luckily, another straightforward pregnancy where all I needed to worry about was getting my home ready for labour and our new addition. Georges birth is where the hic-cup began, all was planned for a homebirth but unfortunately, as luck would have it, the homebirth midwife was ill and it ment, at the last-minute I had to go into hospital. But, thanks to our health system, that was not a problem. A midwife greeted me, showed me to the birthing suit (like home from home) and I delivered George in water half an hour after arriving at the hospital. With this pregnancy, I have been advised a homebirth may not be a good idea. Due to this being my fifth pregnancy (sixth baby) I am at high risk of haemorrhaging after delivery. My consultant explained the risks and told me she would rather me be in hospital for the delivery, but of course If I wanted another homebirth she would support me, as long as I am aware of the possible risks. If I’m honest, after my last birth, I am quite happy going into hospital, but my point is, I have a choice. You might be wondering why I am going over all my birth stories again which I have already talked about in previous posts. After listening to some of the comments on the Facebook page from the American mums I couldn’t believe what I was reading! -In some states in America Homebirth is illegal? 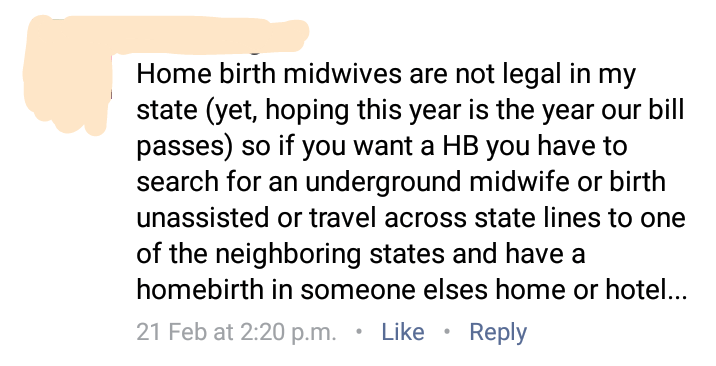 -If you live in a state where homebirth is not illegal the chances are Midwives attending your homebirth is illegal. Therefore, the only option for a homebirth is to have an unassisted birth! -One mum to be from Louisiana told me that it is illegal for Birthing Centres in her State to allow you to attempt a natural birth if you are pregnant with multiples. -I understand, from what the ladies were explaining to me, childbirth in hospital is covered under you insurance. Homebirth, however is not covered and costs the parents to be anywhere upwards of $3,000-$8,500 . 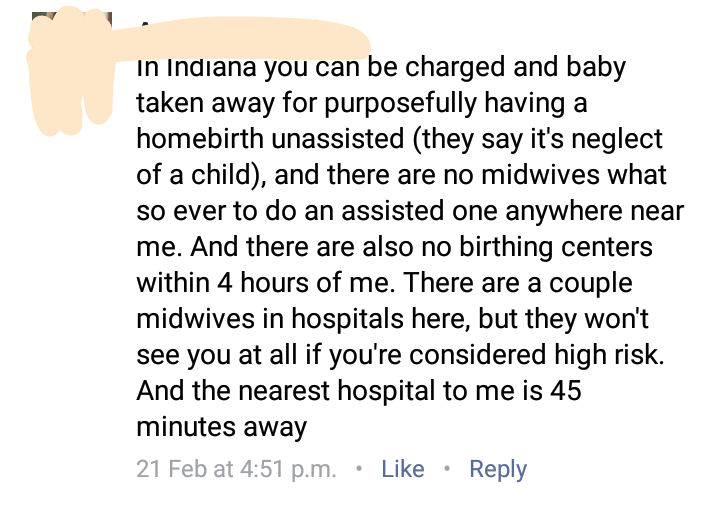 -Some mums choose to cross state lines and book a hotel room just so they can have a hospital free birth in a State that will allow it. -Home midwives are not given the same training as a hospital midwife therefore are not allowed to attend you as your hospital midwife. -The ladies from the States explained that it is common place in the US for the hospital and doctors to treat labour as an emergency procedure and therefore give mothers very little input on their birth. This is one of the reasons Doulas are popular, to help be ‘your voice’ during labour. It also seems quite normal in the USA for the doctors to pull the placenta out after the baby has been delivered. When I read this comment my jaw dropped! 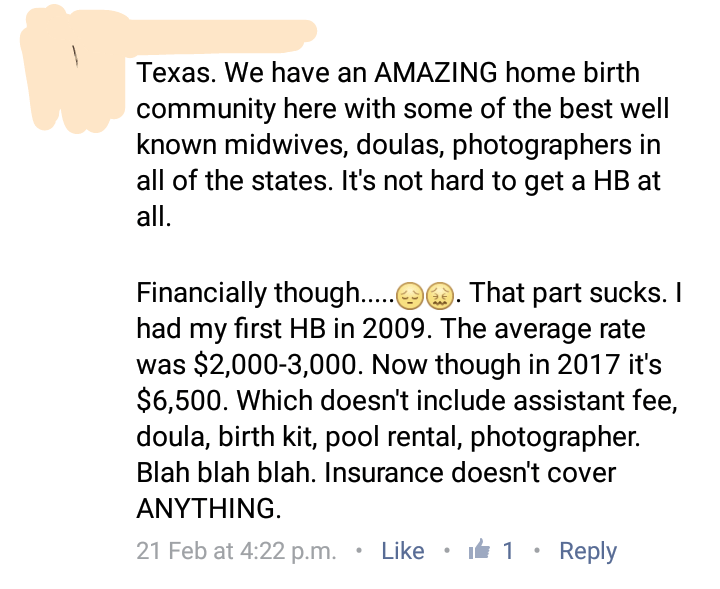 I could only summarize, from the 120+ comments I received when I asked about the homebirth situation in the States, that it varies hugely depending on which State you are in. There were a few mums who told me they had managed to organise a homebirth fairly easily. 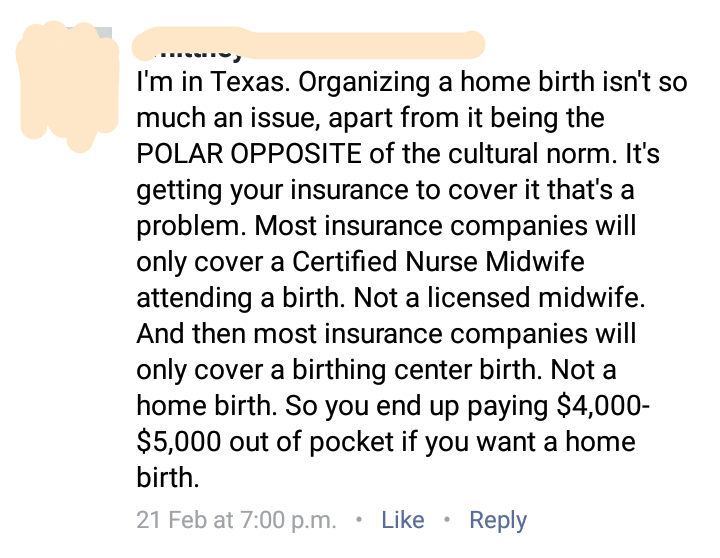 However, one theme was common, if you are lucky enough to live in a State that makes homebirth accessible, be prepared to pay through the nose for it. I was generally shocked that a country I put on such a pedestal and have always thought of as forward thinking can be so narrow minded when it comes to childbirth. 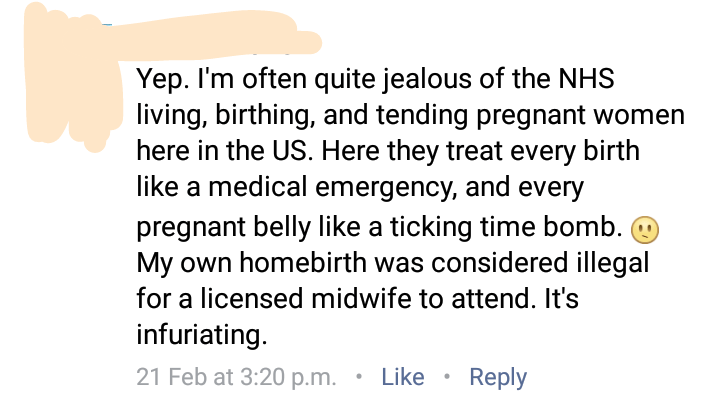 This is not the parents attitude, but the healthcare professionals that feel homebirth is entirely unsafe to the point of negligent. A few opinions I was given, for the reason homebirth is frowned upon by doctors is that hospitals make such a huge amount of money through childbirth they are trying to keep it solely under their roof. I can’t comment on this without any true depth of knowledge on the subject. I think it is safe to say, no matter what your opinion on our National Health Service, when it comes to pregnancy and child birth we are so lucky!! There are always going to be negative stories, but to have this service and its highly qualified midwives who are massivly over worked and underpaid (like most of the nurses on the NHS) we should be so proud. I will never take for granted how easy it is to have the birth I want, receiving huge support from the professional people you need it from the most and without it costing me a penny. I really hope our friends over the pond follow in our footsteps and make things easier for women to have the birth they want. After all, empowerment and control is a huge part of having a good birthing experience. I would love to hear your experiences on homebirths.